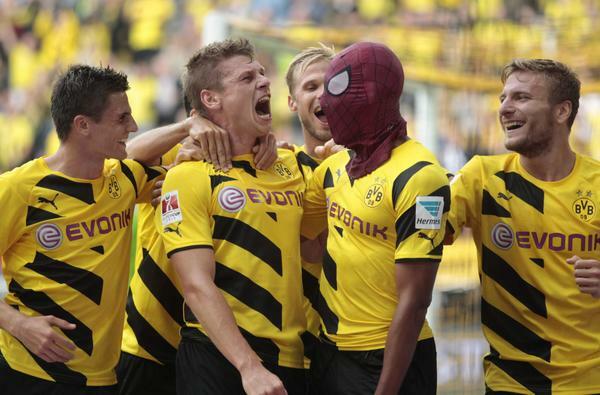 Borussia Dortmund easily beat Bayern Munich with 2 – 0 to win the 2014 German Supercup. For the 3rd year in a row the German Supercup stood between Borussia Dortmund and Bayern Munich. The last two Supercup finals has resulted in one win for each team. Bayern Munich were the 2014 Bundesliga winners and also the winners of the German DFB-Pokal, an annual knock-out tournament, meaning Dortmund had something to revenge. Bayern had a line-up riddled with reserves, where youngsters Pierre Emile Höjbjerg and Gianluca Gaudino for instance were given an opportunity to impress. Dortmund were also without a number of stars, with Marco Reus, Nuri Sahin and Mats Hummels not on the teamsheet. The match started off with great pace, with both teams showing eagerness to attack. Shaqiri had the first big chance of the day in the 3rd minute, but a brilliant save from Langerak denied him. The first real opportunity for Dortmund fell for Oliver Kirck after 17 minutes, but he failed to surpass Manuel Mener, who played a vital role in the defeat not growing larger than 2 – 0. Neuer was without a chance just 6 minutes later, where Henrikh Mkhitaryan attempted to feed the ball to Aubameyang, only for the ball to deflect back to Mkhitaryan, giving him a clear shot at goal, which went past Neuer. After this, Dortmund were more and more in control of the match, but the many created chances lacked the needed precision from the Dortmund players to surpass a well-playing Neuer, resulting in a 1 – 0 score at halftime. Adding insult to injury, Bayern were forced to replace Javi Martinez in the 32nd minute, with a suspected knee injury for the Spaniard. He was replaced by Dante. The start of the second half saw newcomer Robert Lewandowski with a great opportunity to even the score for his new club, but his finish was saved by Langerak, even after a deflection. The second goal for Dortmund came in the 62th minute, where Lukasz Piszcek delivered a cross to Aubemeyang, who rose and headed Dortmund ahead 2 – 0. Bayern Munich were never able to gain control of the match, and it was always looking more likely for Dortmund to score another than Bayern a first. Opportunities arose for newcomer Ciro Immobile and goalscorer Henrikh Mkhitaryan, but Neuer stood firm, despite the two goals. The match ended 2 – 0 to Dortmund, and by that, they secured their first trophy of the season. The German Bundesliga begins in 2 weeks. Football enthusiast from Denmark! 22 years old.